The introduction of the paper trail system is crucial for the EC to maintain public faith in EVMs, whose accuracy has been questioned by Opposition parties, especially after the Uttar Pradesh assembly poll results last year. A performance review undertaken by the EC earlier this year shows that VVPAT machines deployed in all state elections last year had an aggregate failure rate of almost 11 per cent. THE ELECTION Commission (EC) has decided to enhance its reserve of voter verifiable paper audit trail (VVPAT) machines by 10 per cent for the upcoming Lok Sabha polls, in the wake of rising incidents of failure reported in the recent elections. On June 20, the Commission ordered an additional 1.3 lakh paper trail units costing Rs 250.16 crore, which would effectively increase its VVPAT reserve from 25 per cent to 35 per cent. This is apart from the order for 16.15 lakh VVPATs, already placed with the two manufacturing PSUs, to cover all polling stations during the general elections next year. As first reported by The Indian Express on July 25, the poll panel is already struggling to meet the September 2018 deadline it has committed to the Supreme Court for procuring the 16.15 lakh VVPAT machines for the Lok Sabha elections. The Commission is now expecting deliveries of the paper trail units by the end of November. Out of the additional 1.3 lakh units ordered on June 20, Bharat Electronics Limited (BEL) in Bengaluru will produce roughly 79,000 VVPAT machines while the remaining will be manufactured by Electronics Corporation of India Limited (ECIL) in Hyderabad. The EC wants this order to be delivered by October 30. VVPAT malfunctions reported on May 28 from a number of polling stations in the keenly-contested Kairana and Bhandara-Gondiya bypolls had sparked strong political reactions. The EC had to replace 20.8 per cent of VVPATs deployed in Kairana in Uttar Pradesh, and 19.22 per cent in Bhandara-Gondiya in Maharashtra. This led to repoll in 73 polling stations of Kairana and 49 in Bhandara-Gondiya. 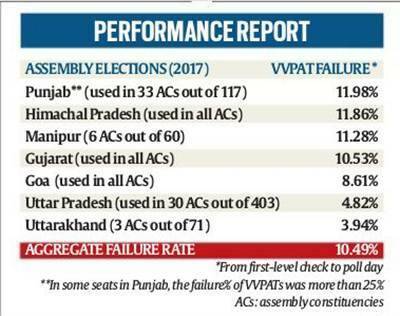 A performance review undertaken by the EC earlier this year shows that VVPAT machines deployed in all state elections last year had an aggregate failure rate of almost 11 per cent (see box). This is much higher than the average failure rate of electronic voting machines or EVMs, which has stabilised at 5 per cent — this includes only 1-2 per cent failure on poll day. Although the Commission has made design improvements to the paper trail machines after the Kairana and Bhandara Gondiya bypolls, VVPAT failures, sources said, are largely because the machines are relatively new and the polling staff are not completely adept at handling them. “Since VVPATs have been introduced recently and many states are handling it for the first time, there is a possibility of relatively high failure rate due to manual intervention. With intensive training and structured capacity building programme, the percentage of VVPAT failure can be reasonably expected to be reduced by 1- 2 per cent only. Despite this reduction, the overall failure rate of VVPATs is likely to remain around 8-9 per cent, which is 7-8 per cent higher than EVM failure,” states an EC note justifying the proposal to allocate a higher reserve of VVPAT machines for the Lok Sabha polls. The Commission hopes extensive usage of VVPATs will stabilise the failure incidence. A VVPAT produces a printout of the vote cast using an EVM, which can be shown to the voter to dispel doubts. This printout is then deposited in a box and can be used to resolve any dispute regarding the poll results. Last year, the EC filed an affidavit in the Supreme Court, promising to introduce VVPATs in all polling stations for the 2019 general elections. The introduction of the paper trail system is crucial for the EC to maintain public faith in EVMs, whose accuracy has been questioned by Opposition parties, especially after the Uttar Pradesh assembly poll results last year. From the first use of VVPAT units in Noksen (Nagaland) assembly bypoll in 2013 to the Phulpur and Gorakhpur bypolls in Uttar Pradesh in March this year, VVPAT slips have been tallied in 532 cases. In each case, the EVM votes have matched with VVPAT slips. VVPATs are replaced when either the Ballot Unit (BU) or Control Unit (CU) fails. One BU and one CU make an EVM. VVPATs are also replaced when the sensors malfunction or due to mishandling by polling staff and inadequate training of polling staff which, in turn, leads to mishandling. The replacements are made from the reserve allocated by EC.